The New Web has brought with it some amazing tools for creating online subject guides. These tools offer the addition of multimedia and multi-format elements such as photos, videos, social bookmarks, RSS feeds, and widgets to traditional resource guides, as well as an interactive dimension which makes them particularly 2.0. Here are a few tools for creating your own 2.0 guides. Got any other ideas for subject guides? Please share them in the comments! 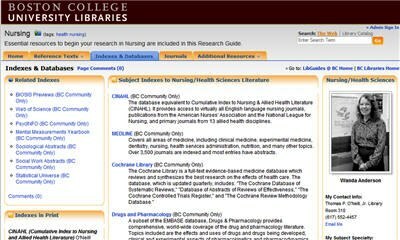 LibGuides is a white-label subscription service which enables libraries to create a branded community of librarian-created subject guides or portals for their users. These subject guides, or libguides can incorporate all kinds of content including pulling in RSS feeds, embedding videos and podcasts, pulling in del.icio.us tag clouds, uploading documents, and running user polls, etc. These guides are very widget-friendly – I was able to insert a Rollyo search box with my custom-made search engines, and libguides can be shared through a Facebook application. Libguides creators – librarians – get their own individual profiles which aggregate all of their guides and contact information, and they can even embed a live IM chat widget. Already being used by libraries & librarians? Hindi for “key”, a koonji is a how-to or resource guide for a particular subject which is broken down into steps. Each step describes a process and can include narrative, recommended links lists, tips, videos, and images. Users can add and recommend links, vote for and add tips, discuss guides in forums, and rate koonji guides. Here is a resource guide and a technique for using the linkrolls feature of del.icio.us combined with an RSS feed service such as Feed2JS in order to output a dynamic list of resources onto any website. This guide will let you know how to get started with creating your own subject guides utilizing your del.icio.us bookmarks. This technique is perfect for those who want to keep their existing subject guides, with their formatting, on their own websites, etc. but want to be able to offer fresh content regularly without the hassle of updating pages.